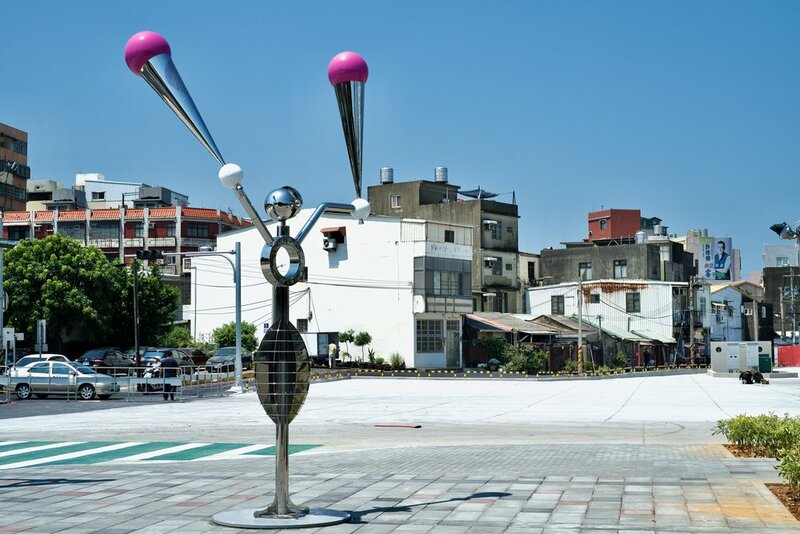 The first major international land art festival in Hsinchu. Inviting 15 local and international artists, creating tailored landscape art installation from Hsinchu Houzhan to 1916 Park (Hsinchu Park), with an exhibition period of one year, indoor and outdoor exhibition opening to the public every day, all year-round, we invite visitors everywhere to join the festivities. This artwork begins with a wind powered kinetic installation, combined with the special features of the city flower (azaleas), creating a landscape installation that allows viewers to be immersed inside the flower. The work is created mainly from bent circular pipes, in taller, shorter, positioned densely or sparse way, resulting in a dynamic visual sense. 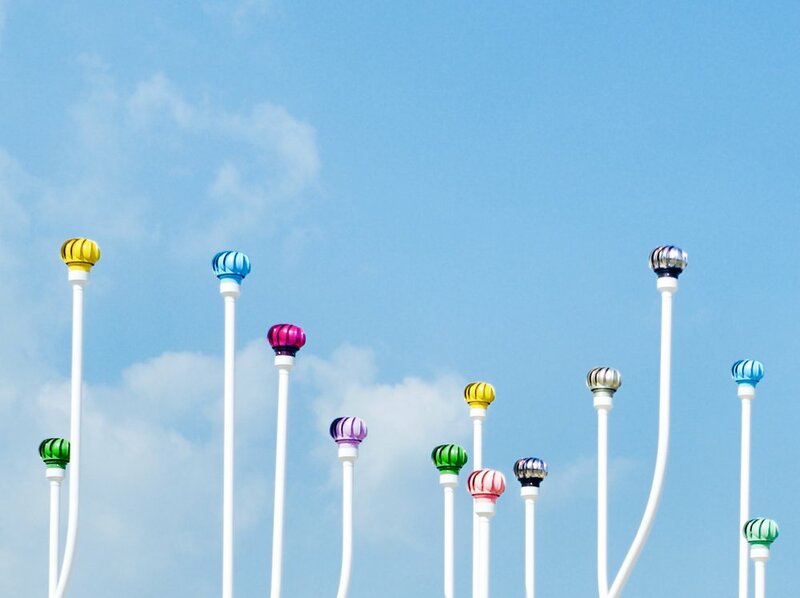 On the top of each pipe are different colored balls moving with the wind to create a rich appearance. As the site is located in the car park, several large and small platforms are created with North America cedar wood to soften the hard asphalt and attract passerby to pause and enjoy. This work is a continuation of some of my reoccurring themes, where I dive deeper into questions involving the human figure and the protagonist ́s interaction with space, surface and each other. I am exploring the fragmentation of narratives and frozen moments of kinetic energy. This is in turn combined with the tactile textures of the worn walls on which I paint, creating a juxtaposition of traces of stories old and new. All the works are spraypainted using stencils and the motifs are based on my own photographs of people in public places. 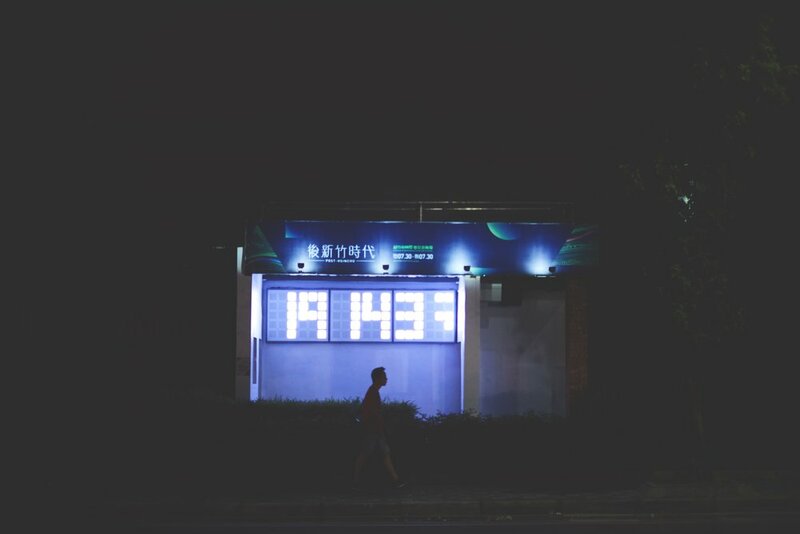 I was inspired by my research on the location of Hsinchu and it being the wind city of Taiwan. This is the reason why I wanted to add an extra layer of a local twist to the wall by painting dancers performing windmills. I enjoy using minimal tools to create an object or place on the wall surface. This piece bends the space of image with only graphic black and white line work. I hope the viewers will complete the information and in a way, transpose themselves into the dimension that is created. White-painted bamboo sticks standing all over the circular lawn space, creating a dream-like scene as if it had just snowed. 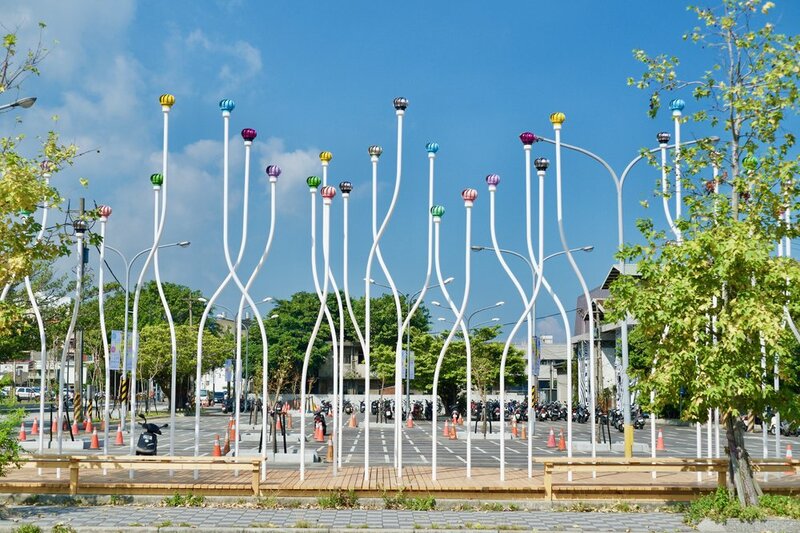 Bamboo sticks sway with the wind of Hsinchu, not affected by the seasons, the artwork stands by the cherry blossoms in spring, embraced by lush green trees in summer, displaying a beautiful and harmonious landscape.